Chrysocolla handmade komboloi created with 19 natural Gemstone Lapis Lazuli beads in barrel shape of 10x14mm diameter with original tibetan silver metals, 33cm total length, 27cm + 6cm tassel, and 60g total weight. It comes with a free gift pouch. Lapis Lazuli Lapis Lazuli is a stone that has existed since the beginning of time. It is a gemstone of total awareness that connects the wearer to a higher truth. 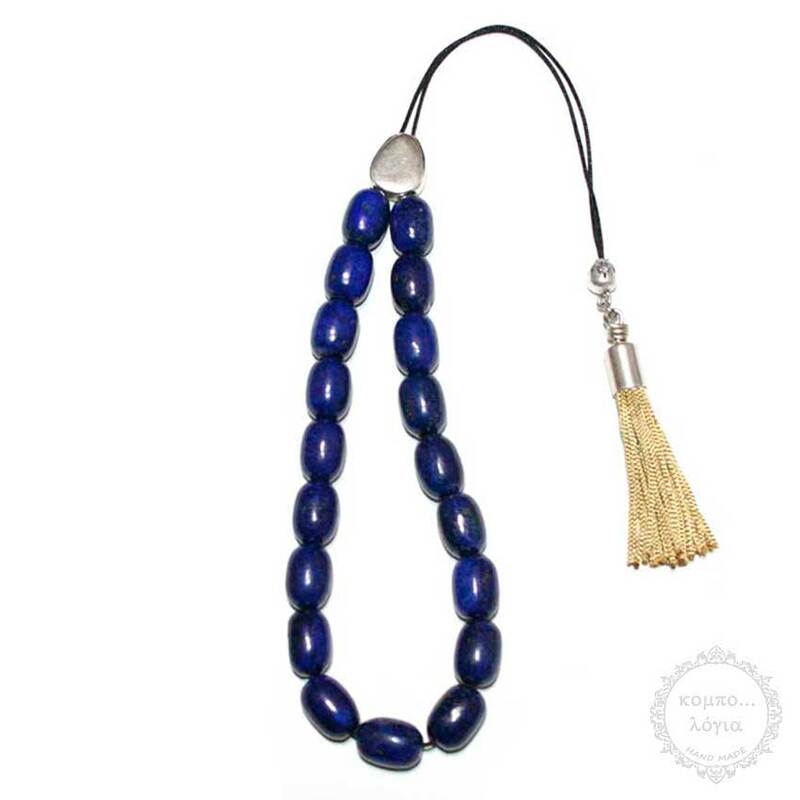 Lapis Lazuli helps to foster verbal expression, opening and balancing the Throat Chakra. It provides wisdom and connects you to your spiritual guardians, shielding you from negative energy and returning any negative vibrations back to their source. IGS (International Gem Society) The use of lapis lazuli for art and jewelry probably originated in Afghanistan and spread to Asia, the Middle East, the Mediterranean, and the Roman world. Many of the gemstones referred to as sapphire or sapphirus, “blue stone,” in the Latin-speaking world of classical antiquity may have actually been pieces of lapis lazuli. Although collectors may debate how much pyrite is ideal in lapis lazuli, most would agree that the less calcite, the better the stone. Calcite can be seen as streaks or patches within the darker blue or can predominate in the mix, giving the rock an overall lighter blue shade. However, it’s not surprising that a stone whose popularity has extended across continents and millennia can reach new markets. Sources: The finest lapis lazuli is found only in commercially interesting quantities in Afghanistan and Pakistan. The Colorado material is quite fine but of limited availability. Badakshan, Afghanistan: among the oldest operating mines in the world (7,000 years). Lapis occurs in large blocks and crystals in white matrix. Source of the world’s finest lapis.